Polvore just launched this awesome mini editor that lets you create your favorite Ruche outfit and you can even get a chance to win $1000 doing it! Ruche is also throwing a giveaway on our own. We will be giving out a $50 Gift Card for our favorite Polyvore outfit creation that you create in our gallery. We preselected 100 items for you to play with! Just drag them in, resize, use the tools and adjust and publish! We will be picking our favorite outfit and the winner will get a $50 gift card! Good luck! Winner will be announced Sept 10th. For more details check Polyvore's blog. I meant to do a DIY post for the backgrounds we used for the "Autumn in Session" Lookbook. Guess what we used for the checkered background? Post It notes!! We used light yellow Staples branded post it notes and pastel orange "Post It" notes. For the brown tones, we had cut out construction paper or scrapbook paper since Post It notes didn't come in these colors. You can switch it up with other colors as well! It is an easy and creative way to decorate a plain wall. 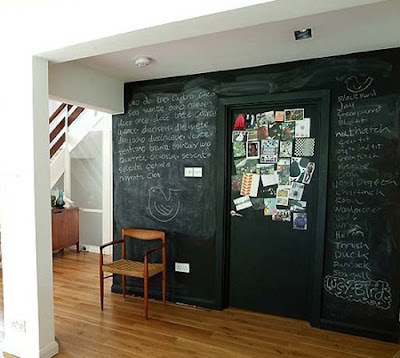 For our second background, we painted a wall with chalkboard paint, which you can get at your local hardware/paint store. This was inspired by the awesome chalkboard wall from "500 Days of Summer". I didn't know how fun it was to have a chalkboard wall! You can still decorate your wall with shelves, picture frames, etc..just like any wall. I'm so happy to announce the launch of our "Autumn in Session" lookbook! It is a combination of fall inspirations and back to school outfits. We focused on a lot of layers to show how you can use summer and spring pieces and turn them into fall outfits. Tights and leg warmers are great to have so you can still wear dresses for fall. Also, LOVE the use of brooches to accessorize! As you can see...I also have a slight obsession for lace up shoes hehe. Stephanie Williams did an amazing job once again..along with awesome makeup artist KC Witkamp and gorgeous Martha from Click Models. Once again, along with a lookbook launch, comes a giveaway! We will be giving away the Silhouette Flower Purse in Walnut and a $50 Gift Card to ShopRuche.com! All you have to do is tell us your favorite outfit AND/OR share the lookbook with your friends and family for extra entries! 1. Let us know which outfit is your favorite by leaving a comment. OR go to this link: http://issuu.com/shopruche/docs/autumn_in_session and there is an embed link at the top. The Giveaway will run through September 5, 2010 pst. Winner will be announced by September 10th. No purchase necessary. We reserve the right to close the contests early or late without warning. We will post the name of the winner by September 10, 2010. Upon winning, you agree that your name can be published on this blog at the close of the contest. You must contact us within 7 days after the winner has been announced to claim your prize. A few weeks back, Stephanie Williams gave us a call with this cool idea she wanted to try out. She dreamt we could make a mosaic picture of a cupcake with different parts of clothing, so we did it =) We met up with Melody from Sweet and Saucy to make the cupcakes for the shoot and Danni from Oh Hello Friend to help design the layout. While we worked on this project, we taste tested quite a few cupcakes, and we ran across a few recipes too. 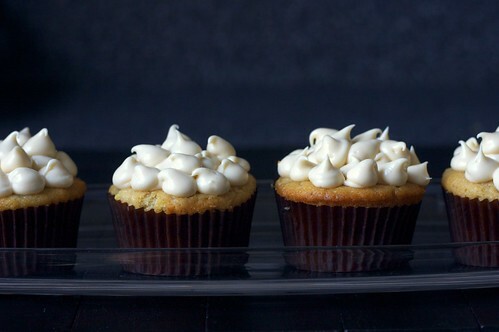 We borrowed thess recipe from one of our favorite cooking blogs, Smitten Kitchen, because these are not your ordinary cupcake. We hope you enjoy, and Indulge Yourself In Decadent Ruffles! Recipes below have been slightly modified and concise. Sift together the flour, baking powder, baking soda, salt and nutmeg and set aside. Cream the butter and sugars together, beating until fluffy. Add the eggs, one at a time, scraping down the sides and bottom of the bowl between each addition, and then the vanilla. Gently mix in the buttermilk, sour cream or yogurt. Stir in the dry ingredients and fold in the peach chunks. In a small bowl, whisk together the brown sugar, cornstarch and powdered sugar. In a large bowl, beat the cream cheese and butter until fluffy. Add the sugar-cornstarch mixture and vanilla, beat until frosting is smooth and light. Chill the bowl in the refrigerator until it thickens back up a bit, about 30 minutes, then spread or dollop on cooled cupcakes. 1. Preheat the oven to 350»F. Line with cupcake paper and lightly butter the paper. In another large bowl, whisk together the egg whites, milk and red food dye, if using, to blend. Add the whites to the batter in two or three additions, scraping down the sides of the bowl well and mixing only to incorporate after each addition. Divide the batter among the three prepared pans. 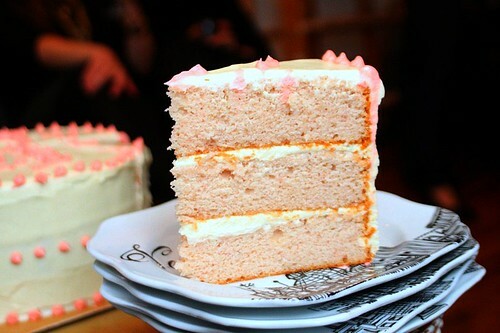 Bake the cakes for 20 minutes, or until a cake tester or wooden toothpick inserted into the center comes out clean. Allow the layers to cool in the pans for 5 to 10 minutes. Invert and turn out onto wire racks and peel off the paper liners. Let stand until completely cooled before assembling the cake, at least an hour.